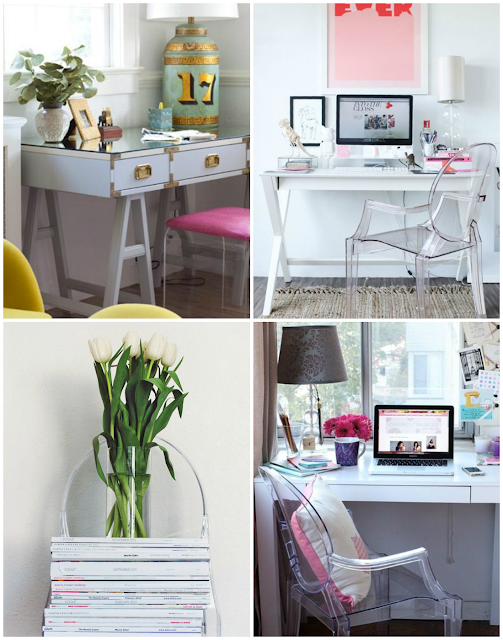 Meet my latest lust: the lucite ghost chair! I'm in love with the chic touch this piece can add to a room or office, and I am dying to have one of my own. Although they are pretty pricey, you can bet you'll find a few in my future apartment! If you shop around a bit, you can also find a few great deals on them... par example: this option. What do you think of the chair? Cute chair! I posted that bottom right picture on my blog the other day. I love ghost chairs as well, they look great with a white monogram decal on the back! I never would have guessed a chair that's essentially invisible would be so expensive! They are mighty chic though.